I have always been a fan of the legendary film, radio, and television comedian Jack Benny. I realize that many of you of the Generation X and Generation Y persuasion don't know jack about Jack. I have also been a fan of having good posture, since good posture tends to indicate health, confidence, and a greater ability to get chicks. Unfortunately, my actual posture is often utilized in mathematical textbooks nationwide as Fig. 15-8, which illustrates the geometric form known as a parabola. Little did I dream that my old-time comedy hero would provide the inspiration for me to finally conquer my posture problem. Jack Benny --- known as the Old Skinflint for his comedic image of cheapness ---walked onto the stage on his television show in the 1950's in a unique manner all his own. Hands swinging at his sides, he strode across the stage to the tune of his theme song Love in Bloom in a manner that could best be described as quasi-pseudo-grandiloquent, or something like that, sort of. Whatever it was, I found that effecting his walk naturally caused me to stand up straighter. Using my Jack Benny Walk, I go anywhere secure in the knowledge that America's beloved comedian is with me, ensuring my outstanding posture. "Hi, Perry, nice to see you," said Len Farbman as I arrived at his home for a small party last Saturday. "Hello, Len, and Welcome to our Program for State Farm Insurance!" I replied. Unfortunately the Walk Like a Comedian Posture Strategy does sometimes also feature a certain blurring of identities. Once inside I spied my friend Blitzstein. "Oh, Fella!" I said to Blitzstein. "Oh, hey, Perry, what's up?" "What's up? No, you're supposed to say "Y-e-e-e-e-s-s-s!" in the manner of Jack Benny's longtime foil, Frank Nelson. "Oh, I didn't know there was a script." I left the pagan Blitzstein and glided across the room, arms swinging at my sides, Love In Bloom resonating in my head, posture immaculate. And incredibly I walked right into the best looking woman at the party! "W-e-e-e-e-l-l-l!" I said, crossing my arms, putting one hand up to the side of my face, and turning my head to one side. And then, unfortunately, I got nervous. "Hello, I don't believe we've met," she said. "What's your name?" "No, no, no! Oh, Don! Don Wilson! Ladies and gentlemen, our announcer Don Wilson!" "Your name is Don Wilson? You're weird! And why are you slumped over like that?" "Your money, or your life? "Well, I don't have to think anything over, loser, I'm outta here! And stand up straight for heaven's sake!" The rest of the evening I'm afraid my posture was like that of an apt candidate for a finishing school run by Quasimodo. I guess there's a few bugs yet to be worked out of the Jack Benny Walk Like A Comedian Posture Strategy. But I'll fix 'em. Because Mr. Benny, the Old Skinflint, and I have a lot in common. You see, folks, both of us are 39! 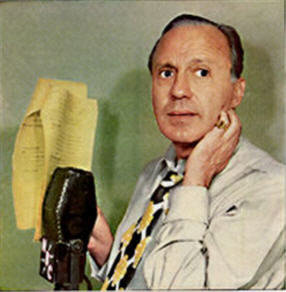 Note: If you don't know Jack Benny, Gens X & Y, you should. Not only will you understand the above jokes (which may not necessarily be worth understanding), you'll meet a great American entertainer. You can also catch the famous walk at the link above. I just turned 60 and had Love in Bloom playing in the back of my head thru the whole piece... but canNot remember who it was that GROANED every time he had his violin... who was it? Adored Rochester... thanks for the memories... OH!! maybe it was Bob Hope? :-) groaning!?!?!?! It may have been Bob Hope, but I think the running gag was that everybody winced when Benny brought out the violin since he was supposed to be lousy, which of course he wasn't. Want to feel old? Check out how many people you know who look at blankly when you mention Jack Benny, Bob Hope, and even Sinatra anymore. Yeah, those guys just ain't no Justin Bieber!